Verdure Aux Oiseaux II - Vertical tapestry shows a detail from the work created in Oudenaerde at the beginning of the 18th century. The original is in the Royal Museum in Brussels. Oudenaerde tapestries were very well regarded due to their quality of production and masterful designs. Here we see stocks and pheasants at the river's edge and surrounded by foliage in both foreground and background. The blue greens of the river contrasts nicely with the warmer tones in the rest of the scene. 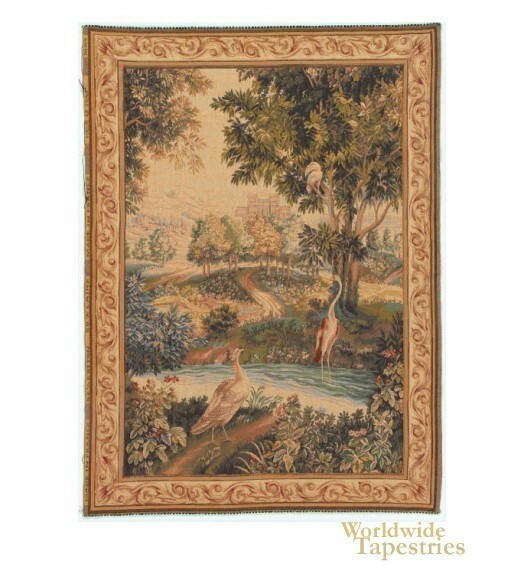 This Verdure Aux Oiseaux II - Vertical tapestry is backed with lining and tunnel for easy hanging. Dimensions: W 43" x H 58"